Greg Callaghan on stage 5 in practice during Enduro World Series round 6, Whistler, Canada, 2015. Photo by Matt Wragg. The Enduro World Series is pleased to announce a new round of qualifying events that will offer riders a clear pathway on to the world stage. The series has been aware for some time it needed a more transparent entry system for those riders devoted to enduro, but wanted to ensure they could create a fair and open structure before its introduction. They believe this has now been realised with the roll out of 18 new Enduro World Series Qualifier events for the upcoming year. These Qualifier events will allow Enduro Mountain Bike Association (EMBA) members to gain points based on their results, then the best three results of the year will be totalled on December 31st to generate their global qualifying ranking. From these rankings the top 80 Men, top 30 Women, top 15 Under 21 Men and Women and the top 20 Masters will be added to the reserve list for Enduro World Series races the following year. But the series hasn't forgotten its roots and amateurs will remain at the heart of the series and can continue to enter through the lottery application process that was successfully rolled out earlier this year. For 2016 the qualifier events will take place with existing Enduro World Series partners, with a view to expanding this to other organisations in 2017. This year the qualifier events will run in tandem with the current reserve entry system so that riders and fans can get the to know the new system before it officially replaces the old structure in 2017. Chris Ball, Managing Director of the Enduro World Series, explains: "We have always believed that we need a more transparent system for entry to honour the riders dedicated to enduro racing, but as a young discipline we've nurtured its growth and are only now ready to take the next step. Ideally we would have liked to announce this system earlier, but we wanted to ensure we had the right concept and the right events in place before we did. We feel we've achieved that now and it's great to see the list of incredible venues that have come on board to host the qualifier events. "By running these events with trusted partners and alongside the current system this year we can allow people to get to know the new structure before it replaces the old one, so there is no confusion about how it will work. It also ensures that no riders will miss out on a race spot as a result of this new concept. I think it's a big step forward for the sport as a whole and I can't wait to see how the first event, the Giant Toa Enduro at Crankworx Rotorua, pans out this week." 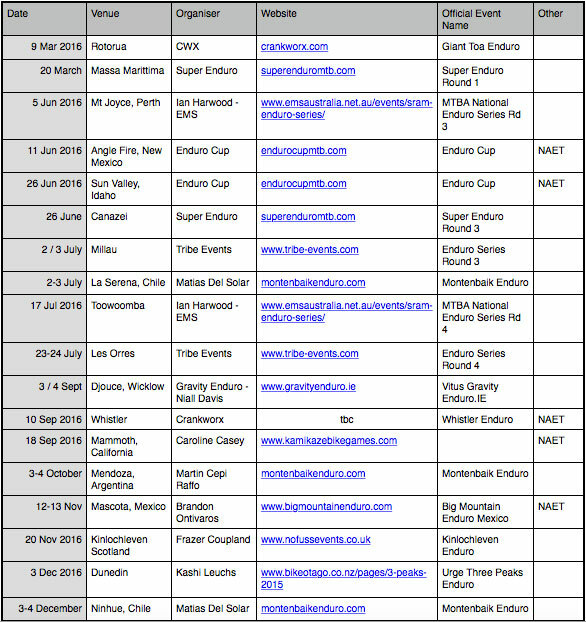 The full list of 2016 Enduro World Series Qualifier events can be found in the table below. More details about the Qualifier events will be posted on www.enduroworldseries.com on Wednesday, March 9th. For an insight into the concept behind the Qualifier events head over to the new Director's Blog.